The state Human Resource Minister Ganta Srinivasa Rao has made this announcement on May 20. Convenor Professor CH Sai Babu confirmed the update. Thus, students who appeared in the EAMCET Medical and Agriculture exam will receive their results from the official website. You can also check it via going through the below mentioned direct link. 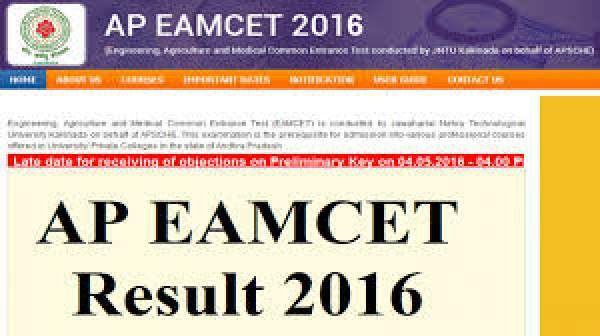 Earlier, the result for Andhra Pradesh EAMCET Medical and Agriculture exam results weren’t declared due to some confusion. It all happened due to the ongoing NEET entrance test. The CM will announce the results at 11 am. AP HRD Minister and EAMCET exam convenor CH Sai Babu have already confirmed the news during a press conference held on May 20. The AP EAMCET exam 2016 was conducted on April 29 from 2 to 5:30 pm for both the streams. After conducting the examination, the board released the answer key. Since appearing in the examination, Students are eagerly waiting for their results to declare at the earliest. The result declaration date was finalized as 20th May and today, it has arrived. So, the wait for all the candidates get over now. More than 98 thousand students participated in the exam. AP Engineering entrance exam result was declared already, but Medical and Agriculture examination results were withheld. It was done because Supreme Court of India announced and made NEET compulsory for all the states. Later on, SC ordered that it will be applied from next year onwards, i.e., NEET will be compulsory from 2017 and coming years. Thus, after getting the green signal, the AP government has decided to release the result of EAMCET medical and agriculture streams. Look and click on the link stating Agriculture and medical Results. You will be asked to enter details like hall ticket number. Take a printout and save it to your device for future use.